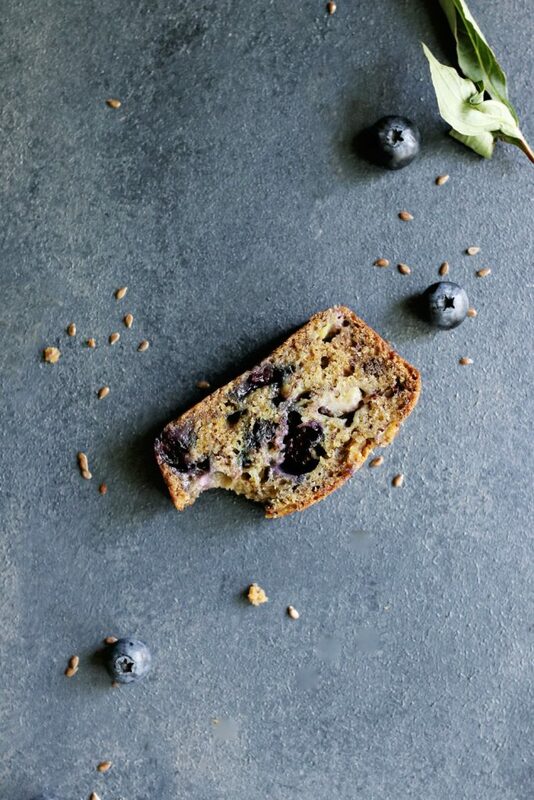 Although I am not much of a baker, I excel at making quick breads–mostly thanks to my mom’s recipes, which she gave to me several years back when I started food blogging. Of course, all those recipes were from the 80s and full of the types of things everyone thought were healthy back then: namely, lots of vegetable oil and margarine. So I set out to update all those recipes and make them a little bit healthier. 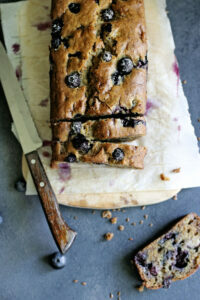 This Blueberry Banana Bread recipe was originally made with sour cream, but I swapped in coconut milk and a little bit of lemon juice for acidity. This swap, along with using flax meal instead of eggs, makes this recipe vegan–but the coconut milk makes the bread suuuuuper moist and tender. The other change I made was to use coconut oil instead of vegetable oil. In general, I’m not big into “put coconut oil in all the things!”–our nutritionist Katie breaks down the facts about coconut oil here if you want to read up on it. But… coconut oil is absolutely my favorite oil to bake with. Nothing beats it. I don’t know the science of it, but maybe it’s that same solid-at-room-temperature quality that made baking with Crisco and lard popular for so many decades? Like I said: I don’t know! All I know is that it’s good! When I make mini-loaves of this bread, I usually pop two of them in the freezer and we eat the other right away. The last time I made this recipe, though, I made one big loaf and then I froze individual slices to reheat for breakfast. It worked out really well and a slice of this bread with a smear of almond butter is pretty much the best way to start the day. Preheat oven to 350ºF. Coat a large bread pan with oil or cooking spray. 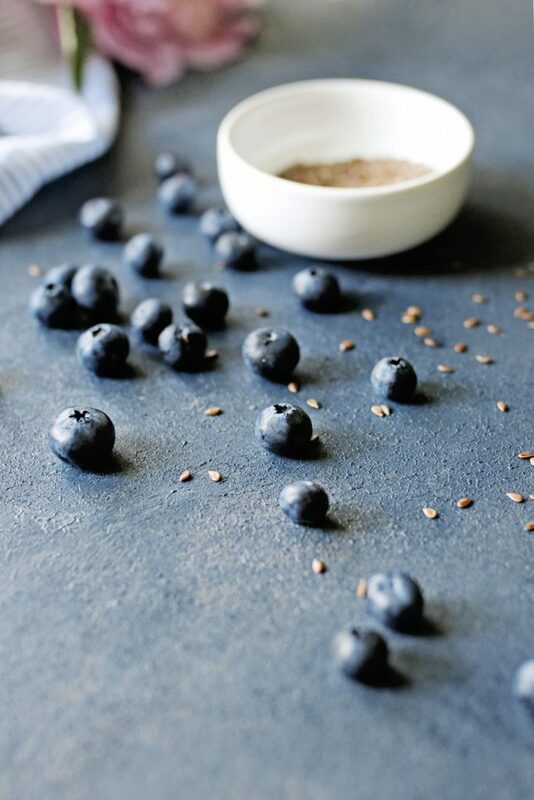 Whisk together the water and ground flax seeds in a large bowl. Let them sit for a few minutes, until the mixture has the consistency of egg whites. Stir the coconut milk, lemon juice, coconut oil, sugar, and bananas into the flax mixture. Slowly stir the dry ingredients into the wet mixture and fold in the blueberries. 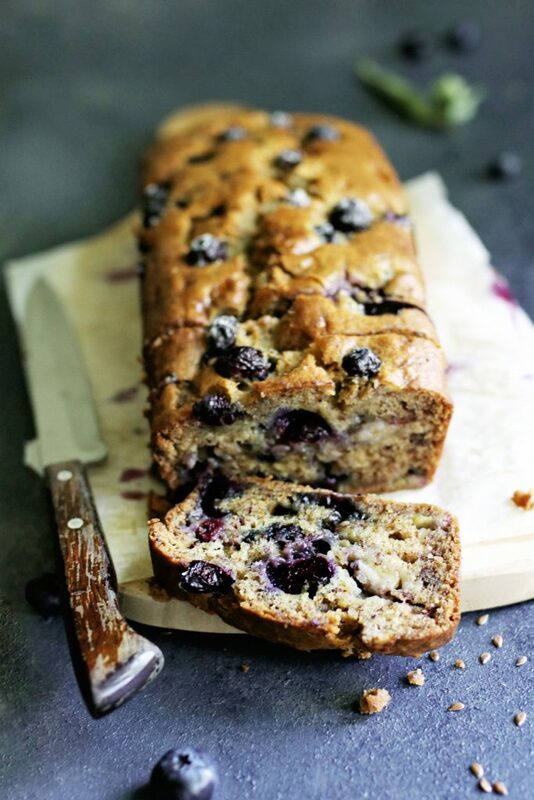 Pour the batter into the loaf pan and place it on a baking sheet. Bake for about an hour or until a toothpick inserted into the center comes out clean; the bread will be dense and moist. Cool for 10 minutes in the pan, then carefully remove the loaf from the pan and finish cooling on a rack. Store tightly wrapped in the refrigerator or in the freezer for up to 2 months. To keep the blueberries from sinking to the bottom of the loaf, gently toss them in a light dusting of flour before adding them to the batter. If you'd rather make smaller loaves, this recipe will fill 3 mini loaf pans. Bake them for 30-40 minutes.